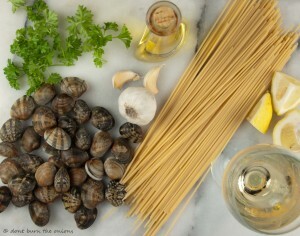 Spaghetti with boozy clams and garlic. I got terribly excited (sad but true!) to find the fishmonger had fresh clams last week. 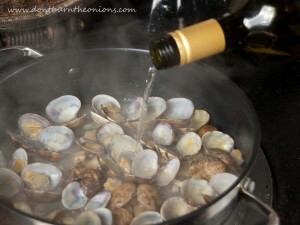 My mother makes clams in a “to die-for” wine and garlic jus, so I rang her for the recipe. It was surprisingly easy to make and I relished every mouthful especially as I thought it would be months before I came across live clams again. But I was wrong. The fishmonger had had such a great response to the clams the previous week that he’d got in some more-the only problem was that I was a little late as he had practically sold out! Whilst mulling over how I would cook my smallish portion, I remembered one of my favourite Italian dishes-spaghetti alle vongole. So using my Mum’s heavenly wine and garlic recipe, I had a go at making it with spaghetti. 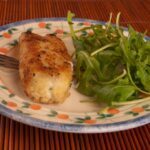 It was incredibly quick to prepare but tasted divine; perfect for a Saturday night dinner for two with a good bottle of chilled Pinot Grigio. 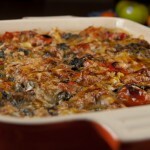 Equipment tip: The best pan for this recipe is a heavy bottomed one with a lid. Clams should preferably be bought live and cooked on day of purchase (or by next day kept in the coldest part of refrigerator). Discard any with broken shells. 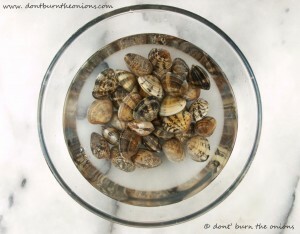 Soak clams in a bowl of cold salted water for about an hour. Then rinse with plenty of water especially if they are sandy. Rinse a couple more times to make sure all grit removed. Chop garlic into thick slices to prevent them from burning when cooking. Cook spaghetti “al dente” and rinse in cold salted water to stop it cooking any further. Sieve and set to one side in a fresh bowl. Heat oil in pan and add garlic, frying for about a minute to soften. Add clams and stir to mix evenly with garlic. Cook for a further minute then cover pan completely to allow clams to steam in their own juices for about another minute or so. Add wine and cook for further minute to cook out alcohol. Add fresh lemon juice and parsley and continue cooking for a further minute. Did you know that this divine tasting food is also good for you? 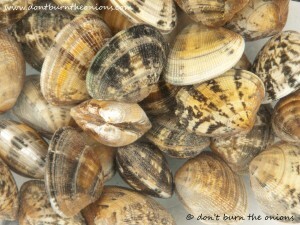 Clams are a terrific source of protein, calcium and iodine. Iodine is an important mineral that contributes to the production of hormones which help regulate your thyroid, which in turn controls your metabolism. Clams, prawns and mussels all contain very high levels of iodine so what more delicious way to boost your intake than by eating this delicious, low-calorie food? 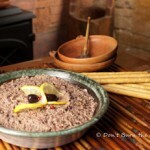 This entry was posted in All Recipes, Fish, Grains, Pulses & Pasta by dontburntheonions. Bookmark the permalink.